If you are a retailer, Native Ground Books & Music invites you to become one of our dealers. We are easy to work with! Our entire catalog is on our web site, or you can download our catalog as a PDF, which you can easily print on your office computer. Let us know if you would prefer us to MAIL you our paper color catalog. Please EMAIL US to be sent our updated order form and terms or download it HERE. Ordering is as simple as giving us a call toll-free (800) 752-2656, or faxing us a completed order form (828) 298-5607. You can also order via email info(AT)nativeground.com. Or if you’d prefer to to order online, please just fill out our Request Form to be set up with an wholesale account on our website. We will send you a confirmation email with your password, and you can start shopping. Logged into your wholesale account, the wholesale price should be displayed. We will add in the actual cost of shipping and invoice you using your standard payment terms. Displays: Our new countertop DISPLAYS are available for our books and CDs. 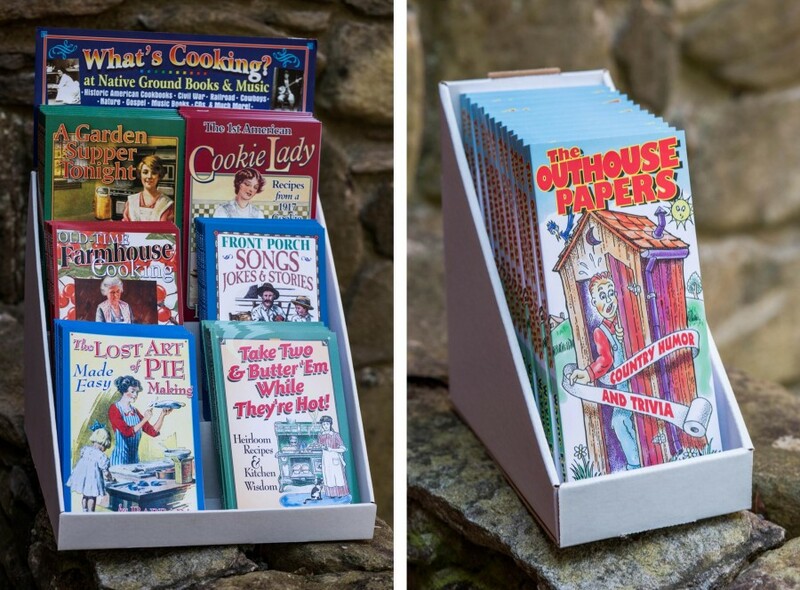 Our three-tier display is FREE with 48 items, and our small display is FREE with an order of 12 ‘Outhouse Papers‘ or 12 ‘Backpocket‘ books. Thanks for your interest in becoming a wholesale buyer of Native Ground products! Please give us just a little information about yourself, and someone will be in touch shortly.